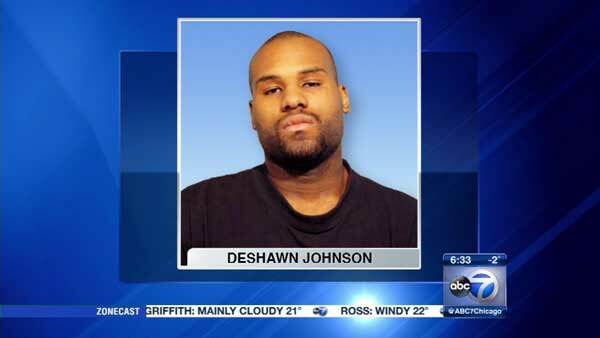 CHICAGO (WLS) -- Deshawn Johnson, 26, was charged in a fatal shooting at a Chinese restaurant in Chicago's Austin neighborhood. Police said Johnson walked into the See Thru Chinese Kitchen in the 5200-block of West Madison Street around 7 p.m. on Oct. 31, 2014 and demanded money. Johnson allegedly shot a 41-year-old male employee in the back. The victim later died. Chang Z. Qui, of the 3200 block of West Wallace, was taken to Mount Sinai Hospital, where he was pronounced dead at 8:02 p.m., according to the Cook County medical examiner's office. Authorities said Johnson was also identified as the man who robbed a liquor store at gunpoint in the 3100-block of West Monroe Street in Chicago's East Garfield Park neighborhood on July 26, 2014. He allegedly fired a shot at a man inside the store. Johnson, of the 5200-block of West Quincy Street, was charged with first-degree murder, four counts of attempted murder, two counts of armed robbery where a firearm was discharged and armed robbery with a firearm.